The Lil Divas have been begging to build a snowman. This is pretty impossible in Florida. the Lil Divas are very excited about all things science! 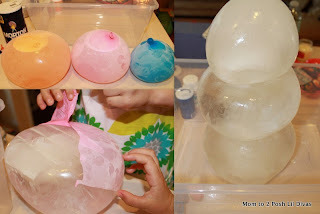 You will need 1 large, 1 medium and 1 small balloon for your snowman. 3. Using a bit of salt to adhere them, stack your ice to form a snowman. Tip: Wet the felt and add just a pinch of salt to stick them on! to some scientific terms & processes - on their level. 1 Snowman would be put outside & 1 left indoors. We were going to observe which would melt the fastest. and recorded their observations both before and after. 5. We placed one snowman outside & left one inside in our kitchen. Both snowmen were placed in bins to collect any water. After 3 hours our snowmen had visibly begun to melt. and was smaller in size from when we first put it outside. had much less water in the bin and was still considerably large in size. the Outside Snowman was nearly completely melted. The Inside Snowman was still pretty large and mostly intact. the results were pretty conclusive about what the final results would be. at the conclusion of our experiment. 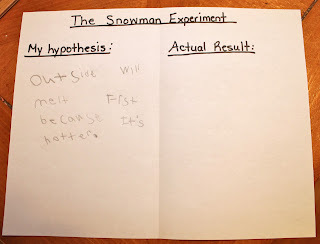 The Snowman Experiment was inspired by this pin on Pinterest. I changed it up a little to suit our needs but that was my inspiration! Check out my Winter Board on Pinterest - so many wonderful ideas. check out our other science experiments. 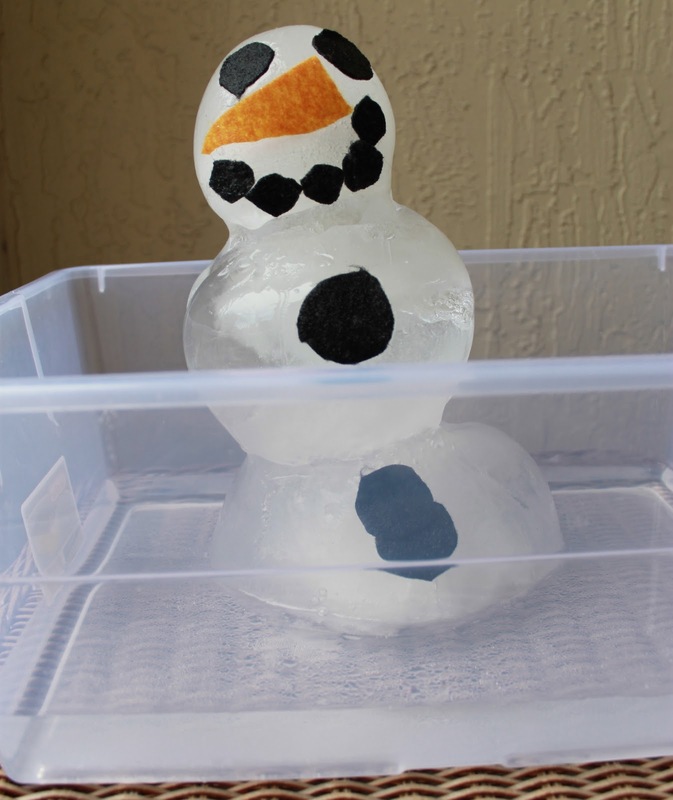 This is a really fun idea for you Floridians, and even for us Northerners.... who wouldn't want an inside snowman to observe? (In a bin, of course). haha, the large/wide bin was very necessary as pieces toppled over but oh, so fun to watch! Awesome! We did a sculpture similar to this (but without the face and details) in August! 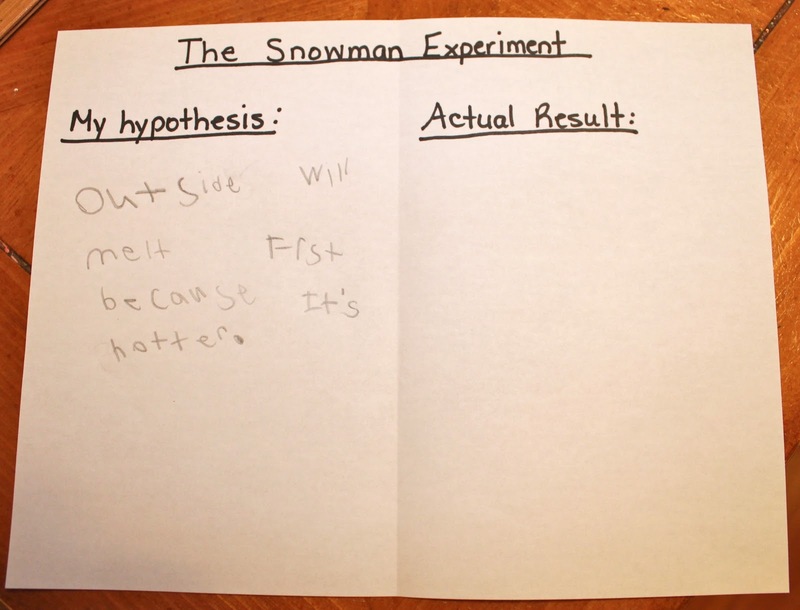 (like your Florida weather) This is a great experiment too! very cool! 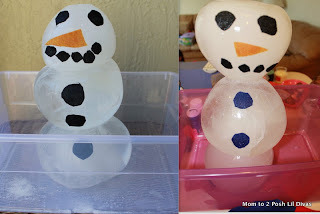 My girls initially wanted to paint ours with food coloring too remembering our ice ball painting from the summer. I had to convince them it was best to leave these as is if we wanted to truly observe them - too much salt would speed things up unfairly. Luckily, they decided I knew what I was talking about for once, hehe! Thank you Kristi, we had fun with it and they began to learn about being little scientists - perfect! Great experiment! We have tons of snow and ice here naturally, but I think we may try your out this coming summer just for fun. :) Thanks for sharing! this would be fun to do in summer - would get a puddle rather quickly I am sure! Would be fun to see how fast he would melt. What a great learning activity!!! I love how you had them record their observations. You do these most fun activities! I love this idea! This is amazingly cleaver!! What a wonderful way to help kids learn & enjoy Science!! I nominate you for Mom of the year =-) Thanks so much for linking up to TGIF! I love your snowman! And the fact that you turned it into a full-blown science activity! I LOVED this so much I featured at TGIF this week - http://livinglifeintentionally.blogspot.com/2012/01/tgif-linky-party-14.html - thanks for linking up. I look forward to seeing you again this week! you have the best experiments!! Love this!! I know my kiddos would love it too...especially since we are lacking in the snow department this winter! The only real snowman we've been able to make was only about four inches tall and still resides in our freezer! I bet the girls LOVED that experiment. SO CUTE! Let me know! What fun! Of course! Thanks you Sarah. Being a Floridian, I love the opportuntiy for the holiday spirit. I also love that it gives you a chance to teach the kids some chemistry with the reaction of salt and ice!